It's been a stressful week... hints of illness, the loss of my long time pet (Romeo), working 76 hours. Finally time to unwind and relax. Searching through the wine vault I decided to try something familiar with a twist so I chose a Chilean wine, Veramonte Reserve Cabernet Sauvignon, 2006. The wine poured beautifully into the glass, a lovely rich deep garnet and some nice legs on the swirl. 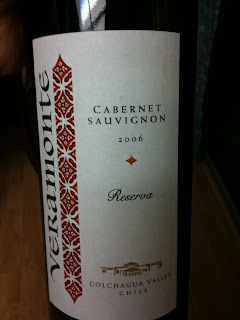 The nose is interesting, lovely blackberry with hints of cherry and just a touch of smoke and earthiness. The taste is quite good, dark fruits, smooth tannins, nice acidity with just a touch of "dustiness" reminiscent of the earthiness I got on the nose. The finish is medium-long and leaves the taste buds watering. Would be fantastic with a burger.